getcalc.com's Margin of Error (ME) Calculator to estimate sampling error or acceptable tolerance of interest of sample included in statistical survey or experiments. This calculator is also known as sampling error calculator. This online statistics & probability tool featured to generate complete work with steps for any corresponding input values for margin of error calculation. Users may supply the values for the below input parameters to find the right amount of margin of error by using this calculator. It's a measure of probability that the confidence interval have the unknown parameter of population, generally represented by 1 - α. 0.01, 0.05, 0.10 & 0.5 represents 99%, 95%, 90% and 50% confidence levels respectively. It's often associated with confidence interval. The standard deviation of sampling distribution of a statistic is called as Standard Error. Margin of Error is a mathematical function or method used in the context of statistics & probability, used to estimate the acceptable tolerance of interest of sample included in the statistical surveys or experiments. It's also known as the amount of sampling error allowed in the surveys. It utilizes the standard error and Z-score value for the desired confidence level. Generally, it's a product of critical value from z-score table and the standard error of mean. Margin of Error is smaller, if the sample size is larger and vice versa. It's a tolerance value of confidence in statistical experiments. For example, 5% margin of error in the results would increase the 47% confidence level to 51% or decrease to 43% confidence level. It's often associated with sample size calculation to include the acceptable tolerance of interest of statistic in the experiments. 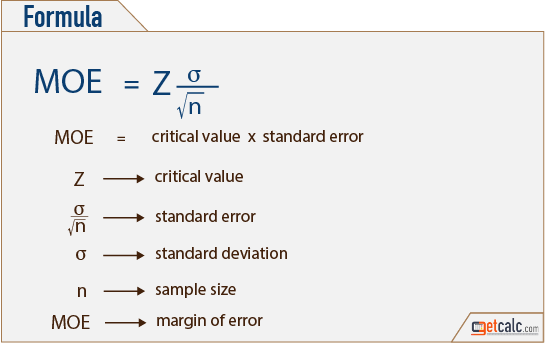 The below are some of the solved examples with solutions to help users to know how to estimate right amount of margin of error for samples by using stanadrd deviation or standard error method. Users can use this margin of error calculator to verify the results with different input parameters. A survey was conducted to know the interest of people includes 750 persons with the deviation of interest of people 0.40. What is the acceptable margin of error included in this survey to make the survey statistically significant at 95% confidence level. A survey was conducted among 560 students to know the interest of reducing the class hours, what is the acceptable margin of error (sampling error) included in this survey to make the survey results statistically significant at 99% confidence level. The deviation of interest of students is 0.75.